Last Friday on March 15, we said goodbye to one of our long term students, Abdullah from Saudi Arabia. Abdullah comes from a small town in the southern region of the country. He was granted a full scholarship from his country to continue his education in United States. That alone tells you so much about him! He is a hardworking student; the kind of students we like at our EC San Francisco. 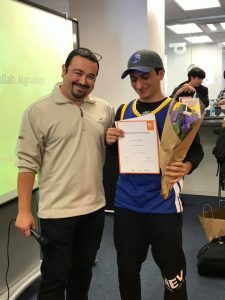 We helped him to finally achieve the first step into college life! Starting as a lower-level student, we are also proud to announce to the world that he scored 6.5 on his IELTS test. A score that granted him admission in a university in South Carolina! He’s starting this summer, and we are happy to send him off to his mini-vacation before the semester kicks off!